Gentlemen, start your engines and prepare yourselves for the ride of your lives! Or at least be sure to have your iPhone ready – we have hand-picked a bunch of games you might want to check out. They're all fun, they're all free, they're all infused with the smells of gasoline and burning rubber. Yup, this post is all about driving and racing games for the iPhone! Now, there's no shortage of iPhone racing games on the App Store, and most of them are pretty sweet. The Real Racing, Asphalt, and Need For Speed series, as well as titles like CSR Racing and Reckless Racing, are all worth trying. But if you're a fan of the racing genre – and you likely are, judging by the fact that you've landed on this page – you've surely played these already. Most of us have. The games below, on the other hand, aren't quite as mainstream, but sure are fun to play! Stunt Wheels is an arcade-flavored top-down racing game full of jumps, flips, and explosions. The graphics are cool and colorful, the controls are executed well, and the soundtrack of the game really makes you want to push the pedal to the metal. But it gets even better. Power-ups throughout the course give you an edge above your opponents - a sudden increase of speed or the ability to crush other cars are just some of the boosts available. Drifting is not the most efficient way to go around a corner, but it surely makes the crowd go wild. CarX Drift is all about spinning tires, about making your car go sideways and staying like that for as long as possible. Fortunately, the controls of the game have been made very convenient to use, and we got the hang of the whole drifting thing in no time. Alas, we were not surrounded by ladies for the stunts we performed, but we sure had fun performing them! This game might not be exactly new, but it sure is worthy of being on the list. MSM2 puts you in control of a dirt bike, and you ride it across a seriously bumpy track. The bumps send you flying through the air and let you pull off all kinds of neat stunts. The more you play, the more experience you gain, and the more resources you accumulate, allowing you to get better, faster bikes. Here's another gem you might have missed. 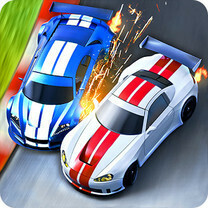 VS Racing 2 is a top-down racing game with easy-to-handle controls and well-made physics effects. Each race you win gives you money to upgrade the performance of your car. But the opponents do get more difficult over time as well. While you can play the game in singleplayer mode, asynchronous multiplayer is also available. Okay, so this might not be exactly a racing game, but there's definitely driving involved. And you get to drive all the cars. Yes, seriously. You see, the game is unique in gameplay. You start by driving the first car to a given point, then the second while your first vehicle is also on the road, following the path you took previously. Then you get to drive a third car, with the other two in the way. It gets chaotic pretty quickly, but that's the whole point. Have you ever had a dream to be a taxi driver? Nope, us neither. But this game makes the occupation look so much more fun than it is in real life! Crazy Taxi is an arcade-style driving game with lane runner elements mixed into it. But you still have control over your vehicle. You get to pick and drop customers, earning cash for each happy one. What would happen if you were in control of a car and you couldn't stop accelerating? What if the cops were after you at the same time? Well, you will get a nice plot for a video game. Smashy Road takes you on a blocky trip down highways and city roads, where bumping into other cars is both fun and rewarding. The more havoc you wreak, the stronger the police force grows. Oh, and did we mention that there are 90 unlockable vehicles in this game? When was the last time you got to drive a boat? It must have been a while. So get behind the rudder of a virtual catamaran and show us what you've got! Pixel Boat Rush is a casual racing game, but it does require some practice for one to get the hang of it. Boats don't have breaks like cars, you know. You must master the skill of knowing when to accelerate and when to release the throttle. Give it too little power, and you'll fall behind. Give it too much, and you'll flip your boat.